The 2016-2017 ski season marked my 50th year as a skier. I started at Blue Knob, PA around Christmastime in 1967 and have been blessed to make tracks every winter since then. I have lived in Northern Virginia the whole time and endured the tortured existence of all Mid-Atlantic ski nuts. While I’m forever grateful for the dedicated folks who manage and operate our local ski areas under every kind of weather challenge, it took a trip to Utah in late January 2017 to collect the ultimate anniversary gift from Ullr. For a half century of perseverance I was rewarded with the snowiest week of skiing in my life. I arrived in Utah on Saturday, January 21, 2017 and didn’t see the sun until about 1:30 p.m. on January 26. 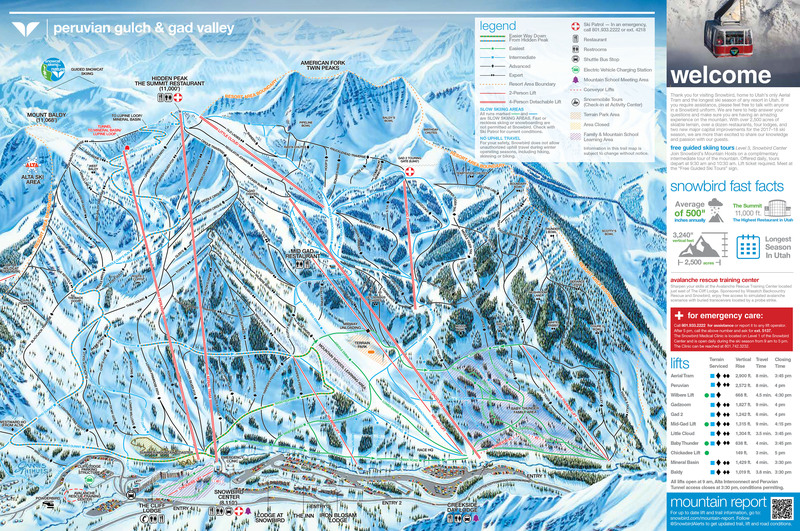 My ski days on this trip were spent mostly at Snowbird (January 22, 24, 25, 26, 28) and one day at Park City (January 27). It snowed every day I was there except my last two days, January 27 and 28. Utah had already received beaucoup snow earlier in the month and the epic storm cycle I caught actually began the day before my arrival. The weather was particularly intense from January 20 to January 24, with approximately 70” of Utah’s lightest and finest falling on the slopes of Snowbird Ski Resort during that period. The Gadzoom chairlift terminal with a six foot snow load. Photo by Jim Kenney. As you can imagine, everyone in Utah was in a powder panic to get to the slopes. But with that much snow, road closures were a big issue. I stayed in Salt Lake City and skied with my son Vince most days. It was very stormy on my first day of skiing, Sunday, January 22. Based on the suggestion of a friend, we drove up to Snowbird at 5:45 a.m. to beat a two hour road closure for snow plowing and avalanche mitigation work. We killed time before the lifts opened by taking a long soak in the rooftop hot tub of Snowbird’s slopeside Cliff Lodge. Early bird gets the hot tub. Photo by Jim Kenney. That first ski day of the trip was amazing and brutal at the same time. Visibility was fair to very poor and the tram was on wind hold all or most of the day. My son (PSIA Level 3) was committed to instructing on the mountain that day, but fortunately his friend Mustafa was kind enough to spend a monster powder day with a slow geezer from the flatlands. We had a great time in fresh snow that ranged in depth between about 12” to 24”, but it was also super demanding for my first day at altitude. And forget what they say about no friends on a powder day. On a truly serious Utah storm day you do not want to be out on a mountain as burly as Snowbird by yourself. Mustafa nearly buried in snow on Lower Cirque. Photo by Jim Kenney. Same skier ripping in the trees beside Gad 2 Chair. Photo by Jim Kenney. Conditions were so severe on January 23 that Little Cottonwood Canyon was closed to vehicular traffic all day due to avalanche danger and we did not ski. After getting beat up the day before, I was OK with taking a rest day unexpectedly early in the week. I munched on Motrin and split my time between doing laundry and napping. Would you believe I had a nightmare about taking a head-first wipeout and not being able to dig my way out?!? My second ski day at Snowbird on January 24 featured possibly the deepest and best quality snow I’ve ever skied. It was a Tuesday, but thousands of locals surely called in sick. It was a day that took patience. The powder hounds were out in force and a lot of terrain was delayed opening. I skied with my son from bell to bell, but only the Gadzoom chair (1823-foot vertical, 6457-foot length) was running at first. As the day went on other chairs and the Snowbird Aerial Tram (vertical 2,900 feet) came online. Each new opening created a rush to pillage virgin territory. What an experience, what a mountain! Vince K. in his happy place near Mach Schnell. Photo by Jim Kenney. My third ski day at Snowbird on January 25 was another sweet one. The snow kept coming at a rate that seemed like about one foot every 24 hours, but the visibility generally got a little better each day. I skied with my son and his friend JW who used skis that were 141mm underfoot. It was very interesting to observe someone up-close driving skis that big through deep snow. It looked like he had two snowboards stuck to his feet and his motions at times were more like water skiing than snow skiing. When Baldy opened for the first time in several days the guys left me in the dust, err powder, on the hike. I was on borrowed Volkl One skis all week that were 116mm underfoot and I did a lot of flailing in the deep pow, but it was fun flailing and each day I got a little more comfortable. JW rocking 141mm skis. Photo by Jim Kenney. My son and I were up at Snowbird again on January 26. A lot of locals did not venture out this day since there was only about 3” new snow and they were spoiled rotten by then. The temperatures remained fairly cool all week and the storm leftovers consisted of two to three feet of light, pillowy chop all over the place. The sun finally came out for about an hour between 1:30 and 2:30 p.m. and I took only my second run of the week in Mineral Basin. I hit a fluffy line straight under the Mineral Basin chair (1,400-foot vertical), but soon the visibility deteriorated again and another run in the largely treeless Basin was out of the question. I returned to the frontside of the mountain where the snow had filled in everything and made many formerly gnarly places much more accessible. This video shows me poking my way down Elevator Chute in the Upper Cirque area. It was taken by a friendly snowboarder I met moments before dropping into the chute. Vince K. in the white room. Photo by Jim Kenney. January 27 was a much appreciated sunny day and the locals like my son had mostly all returned to work. I drove over to Park City for a day of relaxing skiing by myself. I parked at the Canyons Cabriolet and completed a mellow survey of the terrain ranging over to Jupiter Peak and back to the Super Condor Express. At one point I walked up a short way from the Quicksilver connector gondola mid-station and skied part of Pine Cone Ridge. The highlight of the day was Jupiter Peak. I made three runs there; skier’s left, right and center. From up top you could see that all of Utah was blanketed in snow. View from Silver Cliff Chute on Jupiter Peak at Park City. Photo by Jim Kenney. On January 28 I skied a final few hours at Snowbird with my son leading me around the Peruvian Gulch side of the mountain. All morning we used the tram and the Peruvian Chair for some great runs. It was a busy Saturday, but the lift lines were very manageable; in fact, we walked-on the tram twice. It was great to have bright sunshine on my last day at Snowbird. It presented a whole new type of fun and I could finally see the terrain I’d been skiing all week! Home-grown guide. Photo by Jim Kenney. Vince showed me some interesting nooks and crannies including a trip way down the Cirque Traverse beyond P-Tex point to the area around tram tower #3, where we eventually spilled out onto Dalton’s Draw. My very last run was the tram’s full 2900 vertical feet straight down Great Scott off the summit of Hidden Peak (elevation 11,000 feet). And then it was over. I took a flight home in the mid-afternoon and that night I slept like a rock in my own bed back in Virginia. It was an intense week. I licked my wounds for days afterward, but you can bet it’s a week I’ll never forgot. Last run looking down Great Scott. Photo by Jim Kenney. Taking a wild guess, I have maybe 900 life-time ski days? Over the last 50 seasons most of those days have been in the Mid-Atlantic, but I’ve also skied quite a bit in New England and out west. I believe I have the equivalent of approximately 23 weeks life-time spent skiing in snowier US western destinations since my first visit to Colorado in 1976. I’ve caught some memorable powder days in MD, PA, VT, CO, UT, CA, and even 28” over a weekend in Canaan Valley, WV just two years ago. This time in Utah, however, was something else altogether. It wasn’t just an isolated powder day, it was free refills for darn near a whole week of blower snow on terrain worthy of Mother Nature’s best shot. One report indicated that during the storm cycle from January 20 to 27 Snowbird received 81” of new snow! I also heard a few days later that the snow base in parts of Little Cottonwood Canyon was the deepest it had been in 52 years at that point of the winter (end of January). I bought my air plane ticket for this trip more than three months in advance and all I can figure is that there is a God in heaven and He bears gifts of white gold for 50th anniversaries. This is what you call a powder eating grin. Photo by Jim Kenney.